At the law office of Brown & Crouppen in Kansas City, Missouri, we are fully committed to helping you secure the maximum amount of compensation for the injuries and losses you suffered as the result of someone else's negligence or wrongdoing. Serving plaintiff injury clients throughout the greater Kansas City metro region and the surrounding areas of Kansas and Missouri, the attorneys at our law firm possess more than 50 years of combined legal experience, and since our founding in 1979, we have recovered more than $850 million for those we have served. As further evidence of our success, our law firm has grown to include seven total offices across the region, and Missouri Lawyers Weekly voted us the "Winningest Plaintiff Law Firm" in the state. This means that you can expect to receive the highest level of advocacy and support for your legal matter whether you have a personal injury or wrongful death claim, a medical malpractice claim, or you need assistance securing your rightful Social Security Disability or workers' compensation benefits. No matter how complex your situation, you can trust our attorneys to do all they can to help you obtain the favorable outcomes you seek. 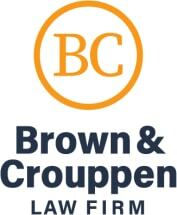 To find out more about how Brown & Crouppen can best serve you and your family during your difficult and uncertain time, you can call our law office or visit our website to receive a free evaluation of your claim. Also, we will not require a fee from you unless we win your case.